Search Engine Optimisation (SEO Singapore) is a technique used to improve the search engine rankings of a website or webpage for a particular keyword query. An effective SEO strategy helps to improve the visibility of your website in a search engine’s natural or organic search results (unpaid results). Search engines such as Google, Yahoo! or Bing usually display pages they consider relevant and authoritative. The higher your ranking on the search engine results pages (SERPs), the greater and better the quality of traffic for your website. To outrank your competitors, you need to conduct targeted keyword research and decide of which of these keywords you want to optimise for. A successful SEO campaign involves both on-site and off-site optimisation. On-site optimisation incorporates search-engine friendly elements into your website, such as optimised page titles and meta descriptions, user-friendly navigation, internal linking and HTML code, amongst others. Off-site optimisation includes link building and social media strategy. The most important aspect of on-site SEO is having top quality fresh and relevant content. SEO copywriting – writing SEO-friendly content – is part of on-site SEO strategy. 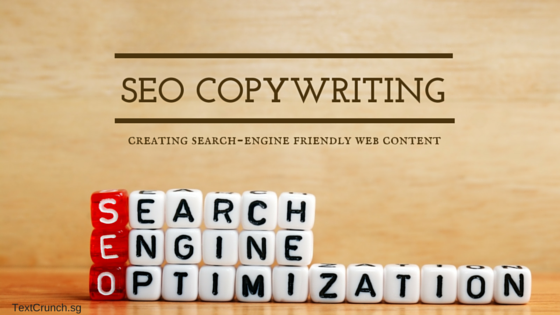 SEO copywriting is a specific copywriting technique for writing web content that incorporates keywords or phrases to help websites rank higher in search engines. Include keywords. The keywords are the phrases people type into search boxes to look up information and are what you wish to optimise your site for. Read naturally. You must include the keywords naturally within your text, so that it flows smoothly. Do not stuff your content with keywords. Be relevant. The content you create must be related to your topic. The more relevant Google considers your content, the higher you will rank in search engines. Be useful. If you create useful content, people will share it. This will also help to elevate your Google rank and increase your website’s visibility. Be connected. Everything on your webpage must make sense. The topics, titles, headlines, subjects, themes, ideas, text, images, audio and video must be related and information must flow smoothly. SEO copywriting is more than just keyword targeting or your Google ranking. It is about creating great content – valuable, compelling and useful content that people will gladly share or promote on social media. And this is what will help to send you to the top of page rankings. In short, you could say SEO copywriting is an art, because it is involves writing relevant web content that both humans and search engines will love. What are the benefits of SEO copywriting? It is organic, which Google respects. It increases your search engine popularity. It results in higher traffic to your website. It results in better quality of traffic to your website. It keeps readers longer on your website. It improves your lead generation as more visitors visit your website. It helps you to better engage your customers and prospects. It encourages people to link to your webpages. It is more cost effective because you don’t have to spend on paid advertising. It helps to position your business for the products and services you are offering. What is the downside of not using SEO copywriting? Even if you’ve spent money on designing your website, there’ll be little return on investment if you have no SEO optimised content. Unless you are at the top three positions on the first page of Google’s search results pages, you’ll get very little traffic. This is because click-through rates tend to drop for lower ranked sites. And if your website isn’t ranking highly for your keywords, your potential customers are going to head elsewhere to find the information on the products and services they need. You could be losing business because of poor SEO copy. Without the correct optimisation by a qualified Singapore copywriter, your website could be stuck on the back pages of Google. Work with you to determine which keywords or phrases you wish to rank for. Include these keywords within the SEO copy in a way that flows smoothly and reads naturally. Write the page titles and meta descriptions for your web pages. Incorporate the SEO techniques necessary to optimise your content. Create relevant content to promote your product or service and encourage conversions. Why should you hire an SEO copywriter? An SEO copywriter is your online salesperson. SEO copywriters have an intimate understanding of how SEO works. They are crucial to conversion. Are you looking to gain exposure on the internet but don’t know where to start? Building a website is like building a house. SEO content is the foundation of your online presence, just as a solid foundation is required for your dream home. The frills – the fancy web design and stunning images – are the same as renovating the interior of your home and adding the furniture. They are a luxury. Without that SEO copy, your foundation is shaky. The best way of growing your business online is with SEO. And for that, you need a good SEO copywriter. Hiring an SEO copywriter to optimise your content is an upfront investment that pays off in the long run. Great content can help to drive search results for a long time, reaching your audience long after the content is put up online. Being on the first page of Google’s search results gives your business authority and credibility. Millions of people search online everyday, looking for information on products and services that they need. Ranking high keeps your business or brand at the top of customers’ minds. The better your SEO, the easier it is for your customers to find you online. The more visibility you have online, the more clicks, the more links, the more sharing and the more this benefits your business. Looking to optimise your website? Get in touch with us now to create SEO optimised content.